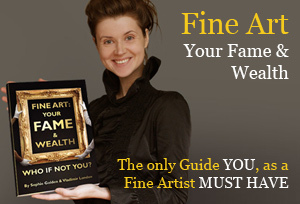 “How to Choose Brushes for Oil Painting” is an important topic for a fine artist. Have you seen the huge variety of brushes they offer at art supply stores? Yes, it’s totally confusing. All the natural and synthetic brushes of different shapes, sizes, brands, and qualities – there are too many choices. 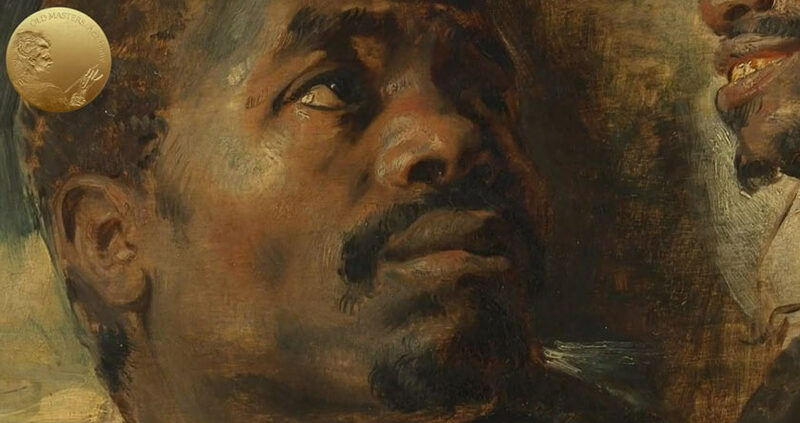 With shapes alone, at least 10 types were invented, as the typical brush shape used by the Old Masters was a Round Brush, nothing exotic. 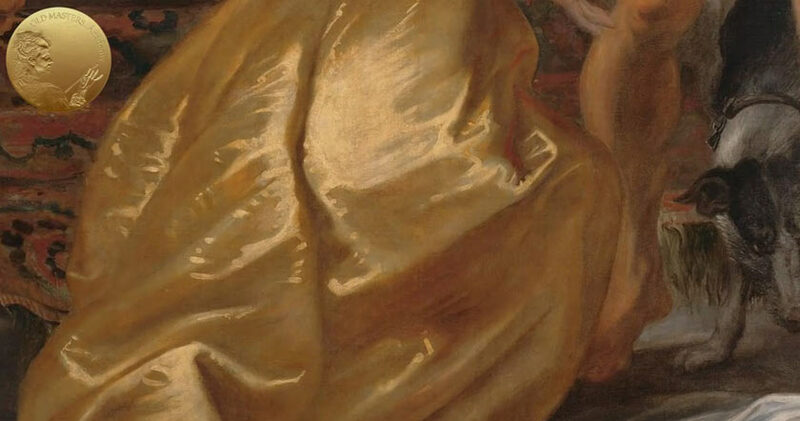 Titian, for example, is well known for his desire to be different from Michelangelo and Raphael. Reportedly he had his brushes unkempt as a broom. Round Brush. There are two sizes of Round Brushes. Flat Brush. There are also small and bigger sizes of Flat Brushes. Bright Brush. There are three sizes of Bright Brushes. This brush is actually a short version of a Flat Brush. 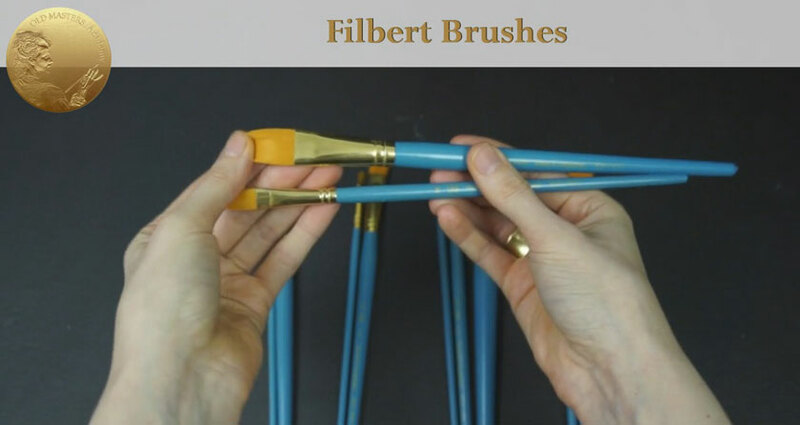 Filbert Brush. This is like a flat brush, only with a rounded shape. Each type of brush produces a different stroke. But let’s be honest, it is enough to have just two types of brush sizes to create impressive and diverse strokes. It is the manufacturers’ wish that we buy many kinds of brushes, that’s why they make them seem vital. Actually, Round and Flat brushes can satisfy your needs entirely. I use Flat brushes more often than Round, but it is more out of habit and I can easily do all of my artworks with nothing but Round brushes of different sizes. Do we need all shapes? Not at all. It’s perfectly fine to have round brushes and flat brushes – they can satisfy our needs entirely. So, what are the best materials for brushes? 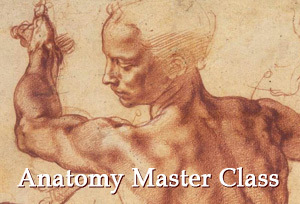 In the Old Masters .Academy ™ we will use both natural and synthetic types of brushes, appropriate for different purposes. 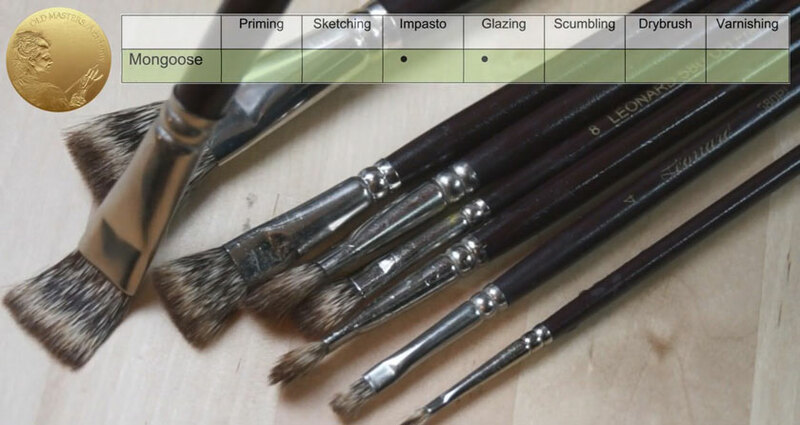 This table, that you can find in your Workbook, helps us understand what the best use is for each particular brush. They are placed in order, from the most expensive to the least expensive. If you have just one type of brush, let’s say only Hog brushes of different sizes, you can certainly apply them in any of the processes listed above – not only in processes that are mentioned as suitable, but also in glazing and varnishing. And if you have more appropriate type of brushes for each type of task – use them. If not, it’s ok, deal with what you have. Let’s look at each brush type, one by one. Sable Brushes are expensive but worth the price. They are long lasting (if you carefully maintain them); they do their job perfectly and are just pleasant to use. These brushes hold their shape when loaded with paint, they will bend and return to their original shape, stroke after stroke. Pony and Squirrel brushes also have soft hair, but they are too soft, they do not keep their shape and are inappropriate for oil painting. Choose Russian Sable, Kolinsky, Red Sable or Black Sable, whatever you find more appealing to you; they perform great, in similar ways. Sable brushes have soft, flexible hairs that are ideal for applying thin glazes. It is possible to use Sable brushes for impasto layers as well. 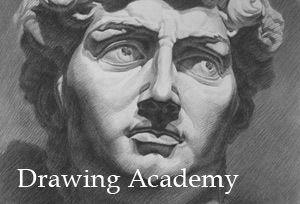 They work excellently in detailed passages, as they form a sharp point which helps you achieve precise strokes. You can also use them for varnishing, however that would be an uneconomical decision – you need to have individual brushes for varnishing that are absolutely unadulterated and doesn’t contain any particles from oil paints. Sable brushes are also perfect for painting smooth layers. I wouldn’t create sketches using scumbling and drybrush methods with such costly and delicate brushes. More rigid brushes, that we will look at a bit later, should be chosen for these purposes. Mongoose Brushes are very much similar to Sable Brushes in performance, but are slightly less soft. Mongoose hair is responsive and firm, yet delicate to the touch. Mongoose brushes are excellent in cases when Hog brushes are too rough and Sable is not stiff enough to move thicker paint over the painting surface. Mongoose is priced between Sable and Hog. You can choose either Sable brushes or Mongoose for your painting process, or you can have both. Hog Brushes are less expensive than Mongoose brushes and has a completely different nature. This type of brush can be used for many purposes, but with limitations. They are perfect for Sketching. 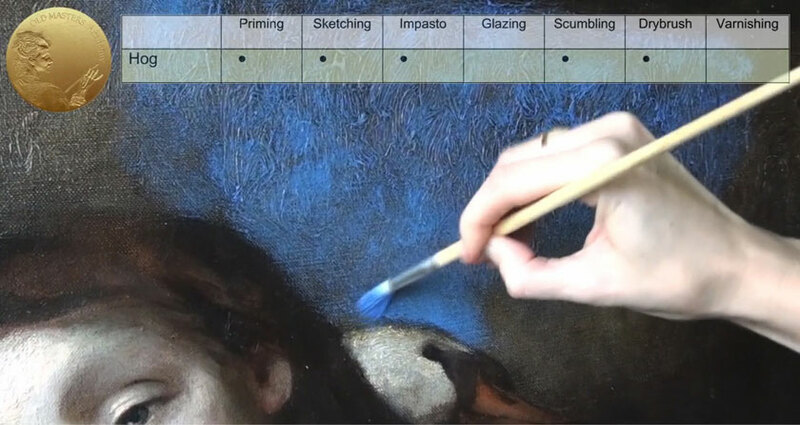 These brushes are suitable for Impasto – brush marks, in the paint, make artwork more vivid. You need to superimpose paint with the brushes carefully, otherwise it’s easy to “plow up” newly applied lower paint. Stiff and hard Hog Brushes are especially created for such techniques as Scumbling and Drybrush. They are just irreplaceable for the task. Bristle brushes are multi-tasking, you can even glaze with them; but test them in glazes yourself. Not everyone will be satisfied with using such a rigid brush during glazing. When choosing a Hog Brush, be sure that the bristles have natural split-ends. If brushes are suspiciously cheap, they are usually trimmed and are usually only suitable for sketching or unimportant works. This is how cheap, cropped Hog brushes look and here you see a completely different quality. When it comes to brushes with natural split-ends, they are shaped perfectly. You can reuse old brushes by trimming them and giving them the desired shape. Such reused brushes can be used for the purpose of Scumbling. Such brushes are even better than new brushes with long bristles. For priming with Gesso – employ broad bristle brushes, rich in hair, and make sure they are flat-shaped like those used for wall painting; the wider and thicker the brush is, the smoother the Gesso is applied and distributed over a canvas. 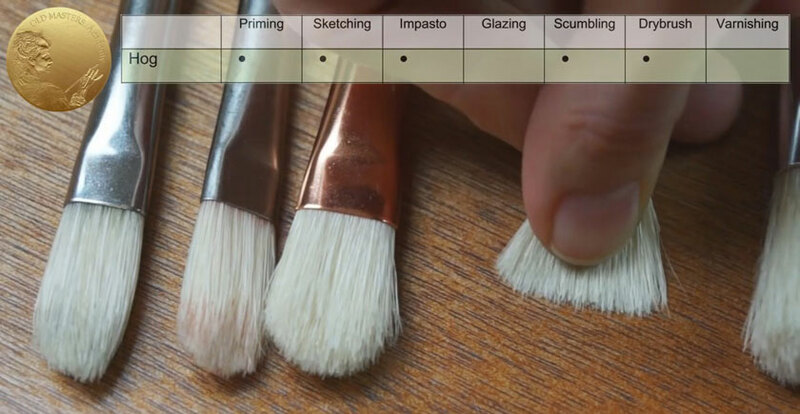 Synthetic Brushes are on the same level as Sable and Mongoose brushes when used in glazing technique. They are equally soft and flexible, however whatever one may say, synthetic is synthetic and you will sense a non-natural feeling during your work, especially if you are used to natural Sable and Mongoose brushes. What may impress you is the price, which is tangibly lower than the price of Sable and Mongoose. Medium sized, flat, synthetic brushes are ideal for final Varnishing – neat flexible hairs help spread the varnish evenly on the painting surface. 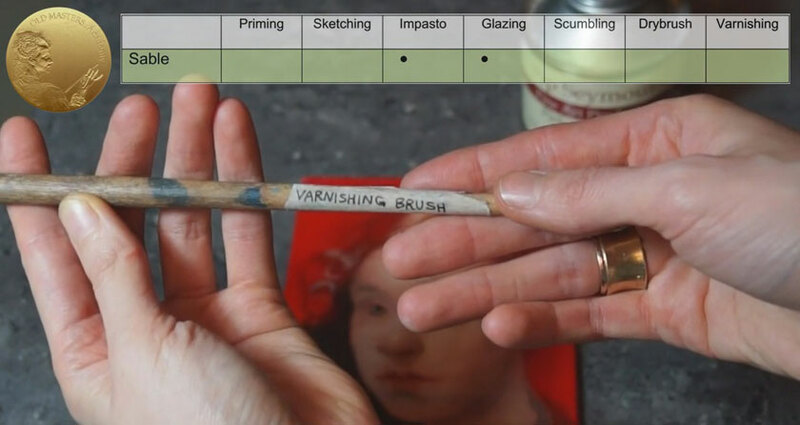 Buy a few Synthetic Brushes, especially for Varnishing, and stick a label to make them distinct from others and keep them exclusively for Varnishing purposes. Varnishing brushes shouldn’t contain oil paint particles. Synthetic brushes can be used as disposable brushes, for any dirty work, numerous sketches, and for covering a canvas with fast and expressive brush movements. Underpainting can be done with these brushes, the upper layers of a painting can be continued by using other brush types.